You probably vividly remember that moment when you sat in a doctor’s office and were told that the explanation for all your confusing symptoms was summed up in a word: fibromyalgia. For some of you, this diagnosis was the first chronic condition you were diagnosed with. For others, it was the second. And for those who had already been diagnosed with multiple chronic illnesses, this one was just another to add to the collection. The reality is that fibromyalgia is one of ten conditions the National Institutes of Health recently labelled Chronic Overlapping Pain Conditions (COPCs ). These include chronic migraine and headache, interstitial cystitis, vulvodynia, IBS, low back pain, endometriosis, TMJ disorders, and chronic fatigue syndrome, In addition, fibromyalgia is commonly diagnosed alongside autoimmune and inflammatory conditions, like rheumatoid arthritis and osteoarthritis. Finally, anxiety and depression are much more likely to be co-morbid (found simultaneously) in people living with fibromyalgia. Many fibromyalgia patients will have the déjà-vu experience of sitting in a doctor’s office and being diagnosed with yet another chronic illness. I recently relived that experience myself. I sat in my OB-GYN’s office and was told that a recent laparoscopy confirmed that I have endometriosis alongside my fibromyalgia. I told myself that after years of dealing with chronic pain, this was no big deal – same problem, different location. All I needed to do was learn what my treatment options were and then go home and use the self-care skills I have developed over the years to manage my pain. A few days later, while I was examining my incision scars, I broke down in tears. “Get a grip,” I told myself, “this is nothing new“. But as the pelvic pain returned, despite the laparoscopy, and I confronted the reality of dealing with another hard-to-manage chronic illness, I had to acknowledge my feelings of anger and sadness over this new diagnosis. Intellectually I know that being diagnosed with endometriosis will not change my life as dramatically as my fibromyalgia diagnosis did. 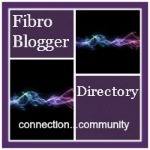 I’ve already had to leave my career because of my disabling fibro symptoms. Instead, I stay at home pursuing hobbies, like writing and calligraphy, while I look after my health. Most often, grief is a reaction to a single, time-limited event… Grief associated with chronic illness, however, is more complex for many individuals. For people who are chronically ill, the losses are multiple and permanent and therefore difficult to resolve. Because these losses are unending, they’re known as infinite losses. The scope of losses due to chronic illness are broad and complex, and they can change during the course of an illness. The loss of health and ability can, in turn, cause losses in a person’s career, social life, sexual function, body image, relationships, parenting ability and daily functioning, among other areas. Most fundamentally, these secondary losses caused by chronic illness can fracture self-identity and diminish self-esteem. The fact that many people with chronic illness feel that their experiences are invalidated by stigma and disbelief can further their sense of isolation. The concept of infinite losses helped me to understand why a second diagnosis brought up so many difficult emotions. I have had to acknowledge that the grieving process over one, or multiple, illnesses is not a ‘one and done’ kind of thing. Grief comes in waves. If your illness changes, or you develop a new illness, your emotional response will also change because, correspondingly, the losses you experience are new and different. Prior to the pelvic pain that led to my laparoscopy, my fibromyalgia symptoms had stabilized and I had reached a state of acceptance about my illness. I wanted to believe this was a permanent state. I resisted the idea that a new condition would cause me to grieve again (because who wants to go through that once more?). However, I have come to recognize that the losses caused by endometriosis in my life are significantly different than those caused by fibromyalgia. For me, endometriosis is entangled with my desire to start a family and be a mother, my body image and my sense of femininity. In contrast, fibromyalgia has primarily affected my career aspirations and the part of my identity that was defined by my professional accomplishments. Mindfulness meditation: “Mindfulness is awareness that arises through paying attention, on purpose, in the present moment, non-judgmentally,” according to Jon Kabat-Zinn, a pioneer of mindfulness in medicine. The Mindfulness Based Stress Reduction (MBSR) program created by Jon Kabat-Zinn to teach mindfulness to patients had demonstrated remarkable benefits for reducing chronic pain as well as anxiety and depression in fibromyalgia. You can find an MBSR program in your community, or there is a free version online http://palousemindfulness.com/. Alternatively, you can learn meditation using a free app on your phone. Two of my favourites include the Insight Timer and The Meaning of Life Experiment. You can practice mindfulness through meditation, body scans, mindful eating, or mindful movement like yoga or Tai Chi. Cognitive Behavioural Therapy: Studies have found that participating in CBT can help reduce pain, depressive thoughts, and improve quality of life for people with chronic pain. One of the core parts of the program is learning to identify negative thinking traps, or ‘cognitive distortions’. These are thoughts that “sound rational and accurate, but really only serve to keep us feeling bad about ourselves” (Grohol, 2016). These programs also focus on helpful behaviour changes like learning deep relaxation as well as pacing activities. CBT programs are run in most communities and your doctor should be able to refer you to one. Find a support group, whether in person or online. It can be incredibly powerful to know that you are not alone in facing the challenges caused by your chronic illness. There are private facebook groups for every condition, where you can find support and people with shared experiences. The #spoonie hashtag can help you find other people with chronic illness on twitter. If you are able to, an in-person support group can be an important source of connection if you are struggling. No matter how much support your family and friends can provide, it can help to talk with people who have the same condition(s) you do. Talk with a professional therapist: Unresolved grief is a difficult issue to work through. Many people benefit from talking with an experienced therapist, one-on-one. My advice is to find a counsellor with experience in working with clients who have chronic illness- your specialist may be able to refer you. It’s critical that you ascertain that the therapist validates the existence of your chronic illness and does not tell clients that the illness ‘is all in their head’. Think of the first appointment as an interview, where you see if you are compatible and ask about their professional experience. You may wish to learn more about the therapeutic approaches used by different therapists prior to choosing one. For example, I found that the empathetic, strengths-based counselling provided by a social worker fit much better with my personality than the objective, analytical technique used by a psychiatrist. Holmes, A., Christelis, N., and Arnold, C. (2012). Depression and chronic pain. MJA Open Suppl (4):17-20. Thanks for stopping by and reading 🙂 I’m always so glad to hear a post has been a worthwhile read for someone else! Hello, Endo sufferer as well. I loved this particular part that you wrote: “I have had to acknowledge that the grieving process over one, or multiple, illnesses is not a ‘one and done’ kind of thing. Grief comes in waves.” Great post! This is a great post. I really needed to perspective. Especially on how greiving our chronic illness is not a one time thing, but rather a constant process. Thanks for your comment! It’s absolutely a lesson I always need to re-learn, that acceptance and grief come and go and it’s an ongoing journey. Hope you are well this week!